Are you tired of talking about your problems? Are you tired of going to therapists and rehashing over and over the same old stories, analysis, past memories and thought processes? Now with this CD you can go beyond just talking and trying to ‘figure it out’ in your head. 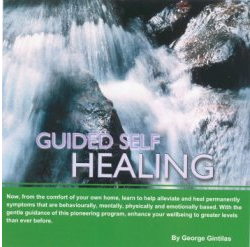 This CD guides you through the pioneering work of Body Psychotherapy and in particular George’s unique EIGHT STEP process that provides a more complete healing and release of old blocks and problems. Tested with hundreds of live actual one-on-one client sessions, the processes found on this CD will help you to move much closer than ever before towards a deeper confidence, health, fulfilling life and wellbeing. A CD with four tracks. Track one is a brief introduction. Track two provides the learning conscious information designed to teach your intellect what you are about to do. In this track I introduce you to the eight step process you will be following in tracks three and four. I summarise each step and explain why each is very important to permanent healing and lasting benefits. These eight steps you will not find anywhere else (that I am aware of.) This is a unique system. Tracks three and four provide two versions of the eight step process. You can take your pick which one you play at any one time. There are two versions to give you some variety. As the CD is designed to be played many times, when you tire of hearing one version you can switch over to the other and then go back to the first later again. This way the process and your sessions stay fresh. A downloadable Booklet guide to the CD. The booklet gives you a transcript of tracks one and two. Especially track two. This you can read at your own leisure to more deeply study and learn the eight steps. There is also additional information and diagrams to help you further along. The booklet will be added to as time goes on and you will be able to download each new version as it is released, for free. Why are there eight steps? Your healing abilities and the way your body heals follow some very real steps. Steps that are not normally taught and very few people are aware of. Skip a step and healing slows or stops, or is just temporary. Allow all eight steps and you vastly increase the chances dramatically, of getting good results and removing long held obstacles to your fuller health and wellbeing. Now you can advance your understanding and ability to heal yourself. Help cut costs of seeing a therapist and get back more control of your life. If things get stuck, you will now know more. You will be able to identify which step you skipped and home in better next time. With each playing of the CDs unique process you can move closer to your goals and a healthier life. Hi George,Sorry it’s taken so long to get back to you with feedback on the Self Help CD, life is busy. I’ve found the Self Healing CD to be fantastic. The death of my husband in April 2003 under extremely traumatic circumstances which left me without my husband, bestfriend and father to our 3 month old baby girl(our first child) life was extremely hard. That combined with the legal situation which was also a result of my husbands death, life has been very trying to say the least. I was unable to `open up’ to counsellers and mental health people. In effect I `shut down’ all emotions save those which boiled over, namely anger. Everything else, grief, shock, stress, disbelief etc was suppressed so I could continue to function. Function is what I did; just. Your CD allowed and still allows me the time in my time and head space to deal with emotions/stuff I wasn’t even aware that I had. After listening to your CD for a few minutes, all I could think was yeah like this is doing anything! Well…just after those thoughts, things happened!! The stomach gurgled, the muscles in my legs contracted and released (I didn’t realise they were stressed!). Parts of my body opened up (that’s the best way I can describe it) to release the pain and anguish or whatever I was/go through when I’m listening to the CD. The results are different every time as are the areas I work on are different. It is very powerful, I just never realised that even though I `shut down’, my body didn’t, and it keeps score!! I highly recommend this CD. Well worth the money!! I also like the personal, caring touch that George has with the sales of his product. It is extremely rare. Keep up the good work’. Hi George,Your package arrived yesterday and I have used the healing CD twice already. Fabulous!I did a session on letting go of anxiety and worry for the goal of being calm, relaxed and confident. The steel band around my upper rib cage dissolved and I felt a lightness and peaceful energy. Today I feel free of tension and confident in forwarding a project I am undertaking, but have to date felt stressed when working on it. I feel excited and energised working on it today, with ideas falling naturally into place rather than worrying if I will get it right. Thanks for your great work and resources George.